This is Part I of our two part candy buffet series. Part II is here. A Bride On A Budget received some items for the purpose of this post. All thoughts, opinions, and additional items belong to ABOAB. 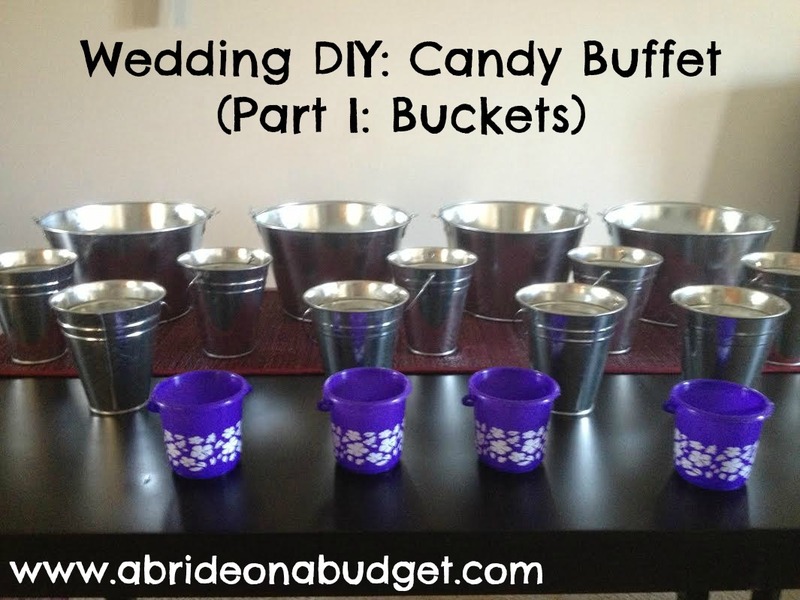 We were setting up a candy buffet at my apartment a few days before the wedding. I needed to get everything set up, counted, labeled, and numbered so that the buffet could be set up the way I wanted at the reception. "Why are you doing a candy buffet anyway?" my dad asked. "Because it's the trendy thing to do," I said. It is. Candy buffets are really trendy and they're not something that was popular a decade ago. There are tons of ways to do candy bars because they're still new, but most of the candy buffets I've seen focus on glass apothecary jars. And those are fine, but to me, they're so rigid and formal -- completely the opposite of a candy buffet. Plus, they're expensive (and slightly useless after the wedding). So I wanted our candy bar to be something different. We had a beach-themed wedding and our wedding favors were a silver galvanized bucket that was decorated and filled with wedding buttermints. I wanted our candy buffet to parallel the favors and keep with the beach theme. So instead of glass apothecary jars, we went with silver galvanized buckets, plus some smaller hibiscus flowered buckets (which matched the hibiscus flowers we had on items in the welcome bags and on our invitations). The reviews of the hibiscus play sets said that they were small, really small. But I didn't listen. Each bucket set came with four tools, including shovels and scoops. 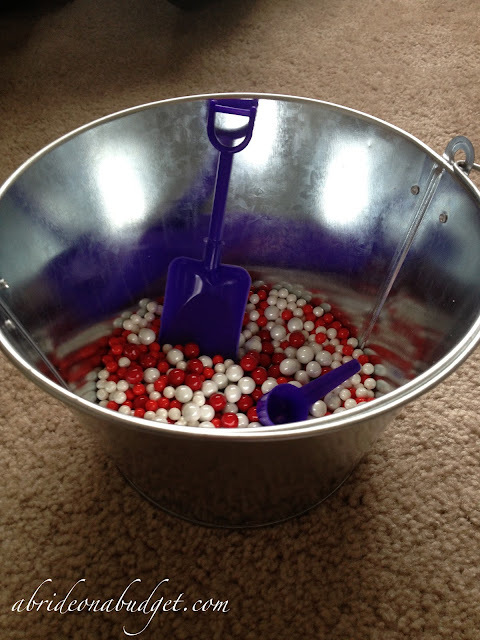 I thought that shovels would be so much cuter for the buckets instead of plastic candy scoops. I never thought that the small buckets would have really small scoops. 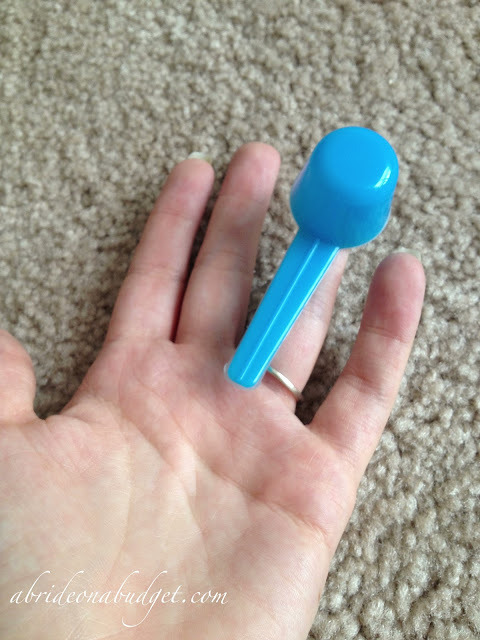 The scoop was almost exactly the same size of my ring finger. I put some candy in the bucket and then tried to size the scoop and shovel. The shovel was okay with me because I knew that the candy would be higher and this would be fine. But the scoop was too small. I needed to use it only for the bucket sets. My kitten, Totes McGotes, agreed. So I decided the shovels would be for the silver buckets and the scoops would be for the hibiscus ones. There was also another major difference between the two: wrapped candy would go in the galvanized buckets and unwrapped candy would go in the plastic buckets. The galvanized buckets aren't food safe, so they needed wrapped candy only (or, small secret about tomorrow's post: we actually lined the medium buckets with plastic bags so that we could put unwrapped candy in them and not worry about anything). I realized that's why people use apothecary jars. They're glass so they're food safe. But I was slightly stubborn when it came to wedding planning. I wanted what I wanted and was going to make it work. So silver buckets that are very beach wedding oriented. Yup, that's what I was doing. Tomorrow's post is going to be about candy and candy buffet math, but I did want to mention the candy that Oriental Trading sells. If you don't want to sit and think about what you might potentially need, you can pick up a candy buffet assortment pack. Choose from blue, pink, purple, and white. It's $69 for nine pounds (and, according to my candy bar math that says you need four ounces per guest, that's enough for 36 guests). If you aren't using one of those four colors as your main wedding color, don't worry. Oriental Trading's candy buffet page shows that you can pick up candies in virtually any color. Choose a color and you will see every candy that is available in it. There are lollipops, gumballs, fortune cookies, even chocolate covered sunflower seeds. Even better, those sunflower seeds (plus many other products) can be personalized for free. If you don't like the plastic bag approach (it's what I liked best), you can go with organza bags, takeout boxes, or super cute bride and groom satin and tulle favor bags. Whatever the style of your wedding, you can find something that works. Just don't forget about a way to close your containers. Ones like takeout boxes come with a folding top, but bags need something like stickers (that's what we did) or ribbon. You can get both from Oriental Trading. Everything at Oriental Trading is really high quality and really low price, so you can pick up everything for your candy buffet for less than the cost of a couple glass apothecary jars. BRIDAL BABBLE: Do you prefer glass apothecary jars for wedding candy buffets or do you think other containers work? Cute idea for a beach themed wedding for sure. Love this, what a cool idea! This would be awesome to use for a birthday party, wedding shower, baby shower, etc! Thanks for the idea! Loved the idea of the buckets. A lot safer and easier to use. I had a wedding where one of the guests broke the glass jar during the reception. Not fun at all! Love that part 2 will talk about the candy math. A candy buffet sounds fabulous. 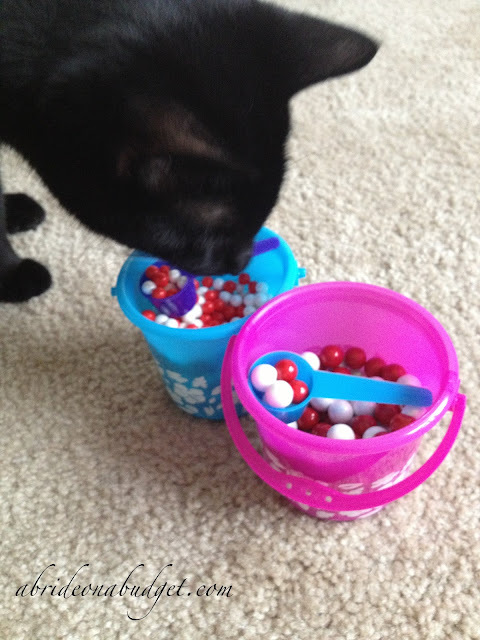 I love your color scheme and the adorable buckets. Nice job!! I love what you did with the buckets! So cute! I love, love love, this candy buffet you had. I wish I could have come to your wedding, lol! I'm using glass vases and metal bowls. I really like those Hibiscus beach play sets ...very fun! 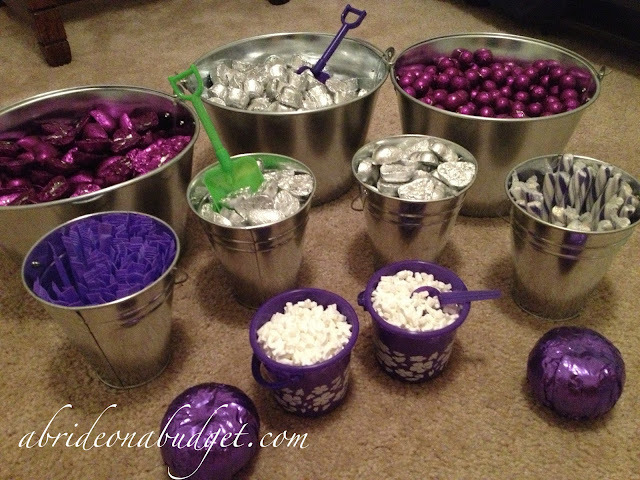 I love the idea of the shovels and buckets for a beach theme wedding. This is safer than glass. I would be so excited if I were attending a wedding and saw that there was a candy bar. I have a serious sweet tooth! This is so helpful! Love Candy buffets!! It's cool that the sunflower seeds (plus many other products) can be personalized for free. Very fun! I like your plastic bag approach. Oriental Trading has great prices! I love the buckets idea. I did apothecary jars for my sister's bridal shower and they were awesome - but one ended up breaking during the drive home! I would definitely prefer wrapped candy, because it's more sanitary and also because I personally am less likely to eat it all at once if it's wrapped. You have a nice selection though! Wrapped candy is the way to go. I love this! I have to start planning my sister's baby shower, and now that I have candy buffets on the brain I might try this! That photo of your kitten is adorable. Thanks for sharing all the details! This would work well with lots of different kinds of containers. Your buckets are fun for a beach theme. I hope this is the trend, because I would love to see candy buffets are more events! Great job! I usually like the glass apothecary jar look, but this is a really nice alternative! Perfectly themed for a beach wedding! I think takeout boxes would be convenient too (though your buckets are cuter). You would have to allocate at least a pound of chocolate for me. Candy bars/buffets are like my favorite part about weddings! I love that you matched hibiscus flowered buckets with the hibiscus flowers on welcome bags. Lovely! I love the idea for the scoops- it was the one item we had trouble finding. I love your beach theme and these candy buckets! I absolutely love your idea. These candy buckets with the shovels are adorable. I never would have thought about looking at Oriental Trading but am not going to see what I can find. Very nice post. I just stumbled upon your blog and wanted to say that I have truly loved surfing around your weblog posts.